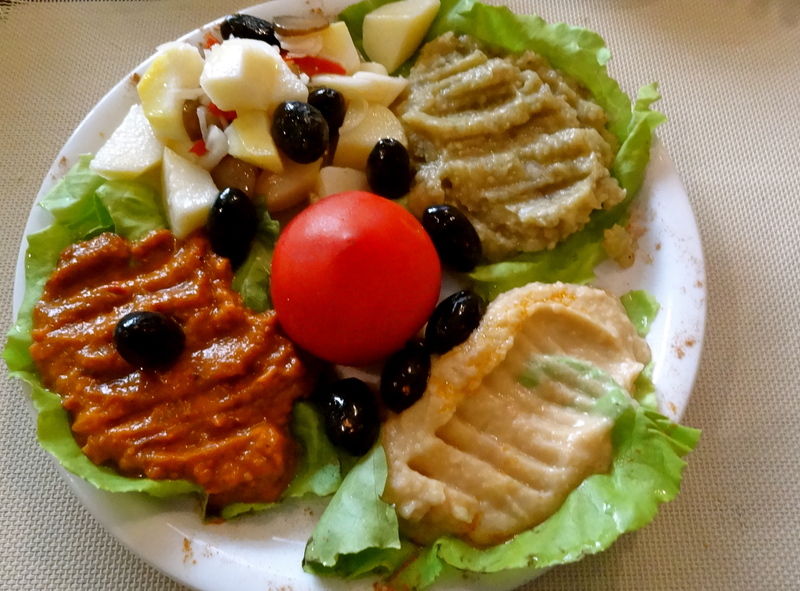 Tasting Romania: A Vegetarian’s Guide to Romanian Food. 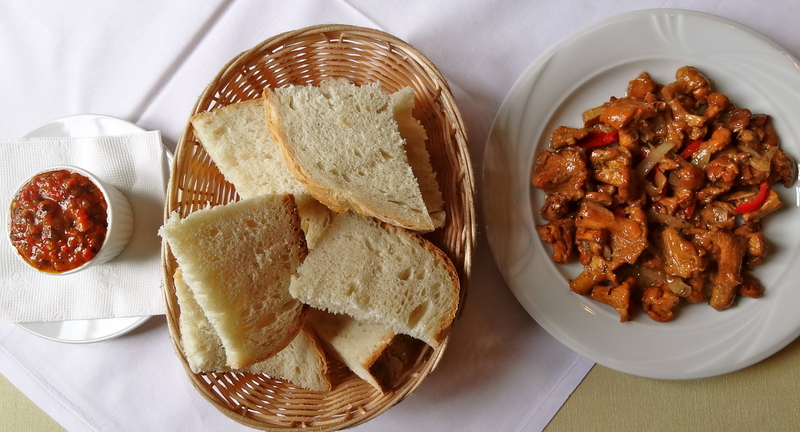 In meat-loving Eastern Europe, Romania was an unexpected treat for my vegetarian taste buds. Partly because the country’s orthodox population goes on a vegan fast twice a week or six weeks a year, and partly because the countryside produces some of the finest vegetables and fruits in the region. A sumptuous dish of mashed kidney beans, topped with onions, and eaten with bread. A hearty bowl of Fasule Batuta. Yum! A popular dish comprising dips of mushroom, tomato, aubergine and chickpeas, served with a salad and bread. Mushrooms in all forms – in a creamy stew, lightly sauteed, cooked semi-dry with other veggies, stuffed with cheese. Ciuperci de pardura (mushrooms cooked with onions and peppers). Orthodox christians in Romania have a tradition of fasting twice a week, or for 6 weeks in the year, during which time they only eat vegan food. Many local restaurants offer a Menu de Post, featuring vegan dishes like stuffed cabbage rolls, zacusca, rice cooked with corn, sauteed cabbage, mushrooms and more. 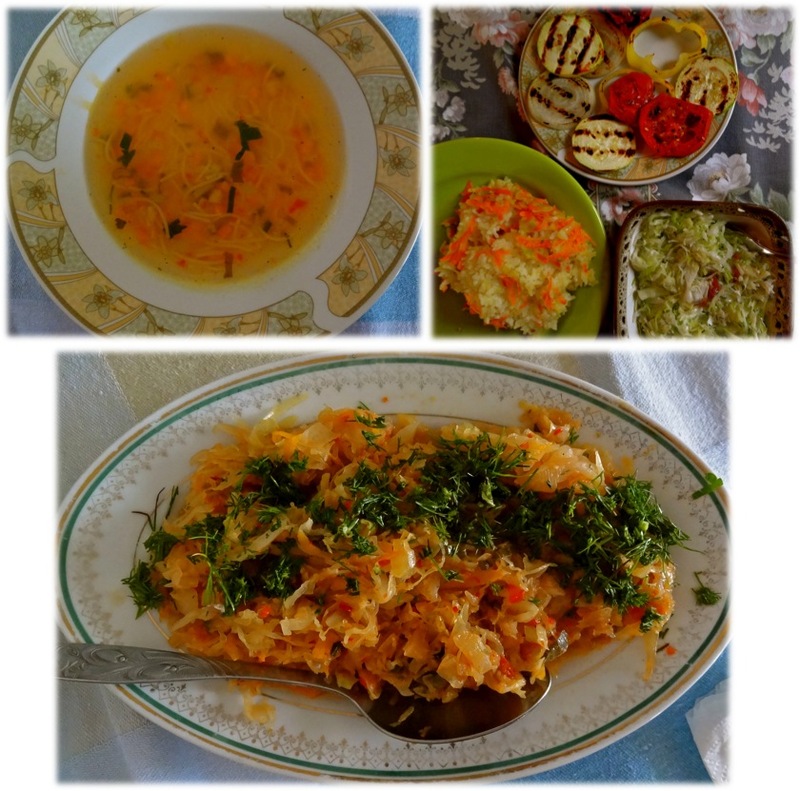 Romanian fasting food at a homestay in Magura. Kremzli: Thinly-cut potatoes shallow fried with egg, somewhat similar to a Swiss rosti. Placenta de ciuperci cu verza: Bread stuffed with cabbage and mushroom, sold in small street-side bakeries. Coronite cu nuca: Sweet bread coated with nuts. Mamaliguta: Corn polenta with layers of cheese and cream; extremely heavy! Cascaval Pane: Breaded cheese, deep fried. Salads, soups and pizzas are easily available. I loved Ciuc Radler, for its lemony, beery taste. Ciuc is a popular local beer, together with Ursus and Silva Black. If you dare, try the local plum brandy – Palinka; it contains 40-50% alcohol and is drunk neat! I thought I could pass out after a single sip. 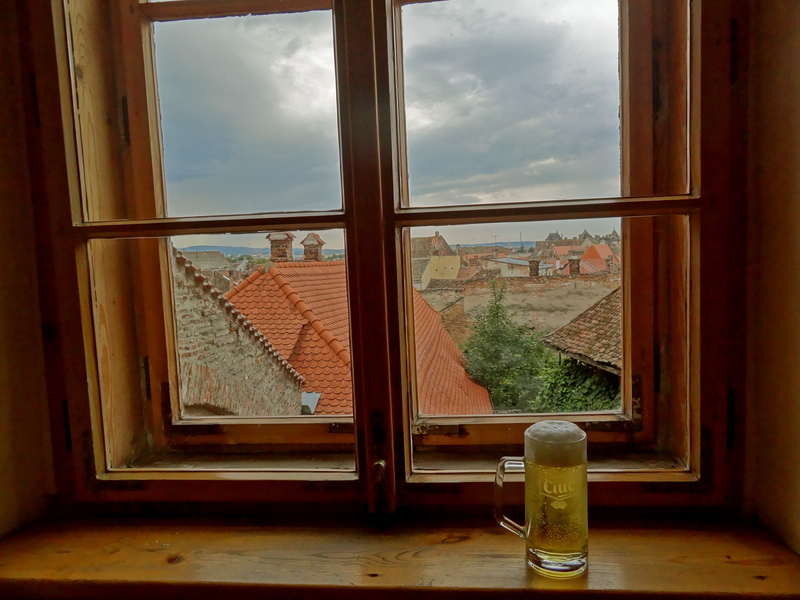 Ciuc Radler with a view of Sibiu from Cafe Wien. 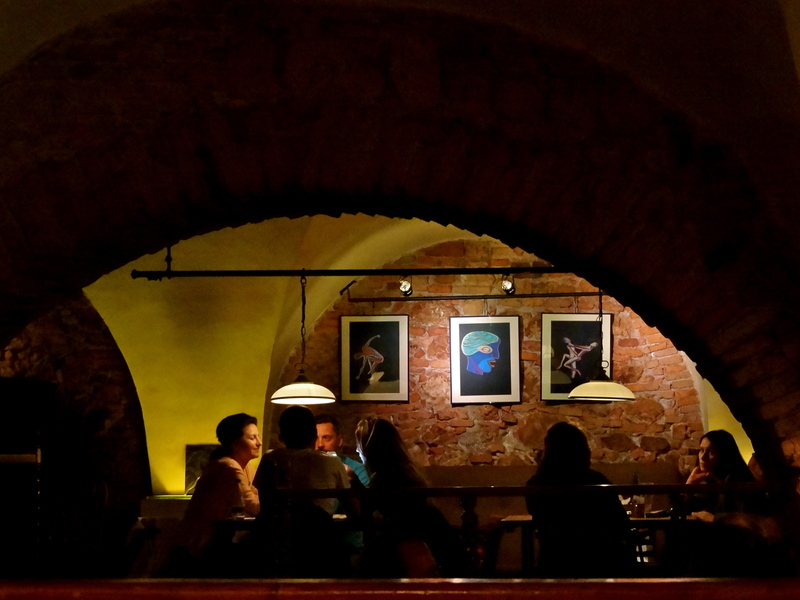 On a quiet cobbled street in the old town of Brasov, Bistro Del Arte is a quintessential European cafe by day and a wine cellar by night, complete with live violin performances reminiscent of the Soviet era. They do an awesome veggie bruschetta, topped with fasule batuta and red peppers. A fifteen minute walk from the bustling old town of Sibiu, Capa is a popular neighborhood joint that serves up delicious mushroom dishes. Though a little touristy with live traditional music and dancing every night, Casa Iurca has the best local food we found in all of Romania, with plenty of veggie options. 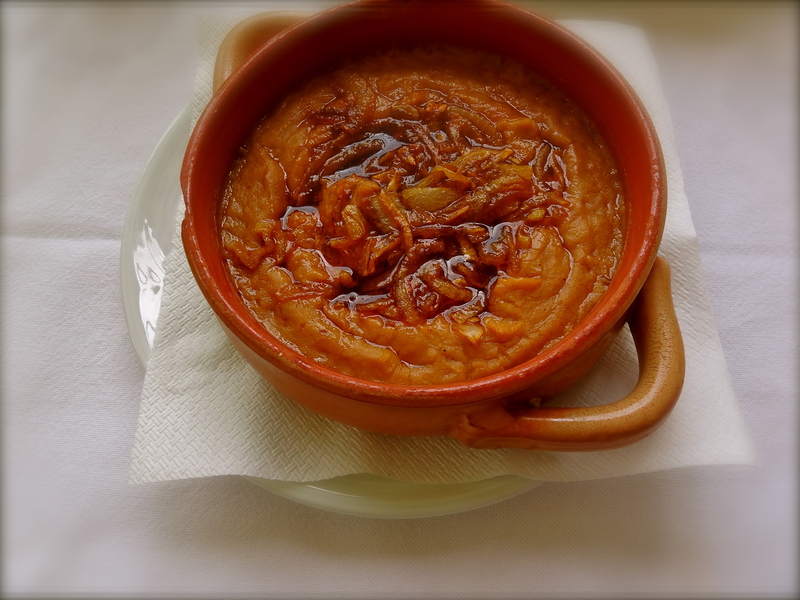 I loved their kremzli, fasule batuta and ciuperci paprika stew. David’s Pub came a second close, especially for their extensive breakfast menu; try the egg and cheese burgers. Tucked away in a local neighborhood on Eminescu Street, Torega is a typical local resto and marked the beginning of my love affair with vegetarian Romanian food. Their gustare vegetariana (vegetarian snacks) are a must try! On our way out of the country, we ditched Bucharest to stay in the much quieter Otopeni (near the airport), and had an indulgent last meal of pizzas and de post goodies from the bakery at Ana Pan Bakery. A night at the wine cellar with a live violin performance, at Bistro Del Arte. Familiarize yourself with the Romanian names of some vegetables to make it easier to order your food: Mushroom is ciuperci (pronounced chiu-per-chi), peppers are paprika, cheese is cascaval, tomato is rosii, cabbage is verza, red beans are fasule, green beans are fasule verde. In popular towns like Brasov and Sibiu, most people can communicate in enough English to understand you are vegetarian. In offbeat villages, ask for food that is de post (for fasting, so no meat, seafood, eggs or dairy). Portion sizes in Romania are HUGE by Indian standards, so you might want to share a dish or two among two people! A 10% tip is expected when no tipping / service charge is levied. Bistro Del Arte by day. What food are you most looking forward to try in Romania? Glad you bring you the message. Go soon! Your ‘delectable’ post makes me crave for more food now. Very informative and full of yummy veggie food. Glad that you had plenty of options in Eastern Europe and surprisingly in Romania. Thanks for sharing the post. Sounds like a lovely treat! Romania is my kind of a place – I love mushrooms! Very interesting to find a wide variety of mouth watering vegetarian options available :). Writing this left me so hungry! Nice post. Informative and interesting. Encouraging for veggies like me to travel to this part. Discovered your blog through blogadda (newbie there) … I am glad I did. Great blog! Wow, this food sounds delicious. I’m very jealous! Gorgeous photos… the food looks so yum! Bookmarked for future reference. Looks wonderful! How did you book your homestay in Magura? Amazing, we have just arrived to Sibiu and are looking for some place to eat here. Yesterday an old lady invited us for a traditional Romanian cabbage pancake. We had it with some cream, cheese and garlic. It was so good. I’m planning to go to Romania the week before easter and this post has brought me (a vegetarian) so much happiness, Multumiri! Is not just food…. And the best city in Romania is Brasov, please don’t miss this town. I work here ( Brasov ) at a *** stars hotel ( PENSIUNEA LAURA ) . Good morning! I love this article! Even though I see it has been written a while ago, I found some mistakes, if you would like to correct them: it is “fasole” not “fasule” and “mancare de post” not “marcare”, “placinta de ciuperci cu varza” not “placenta de ciuperci cu verza”. Also, we use the word “ardei” for pepper more than papika. That’s more like a condiment (a red powder made out of roasted peppers). Previous PostRomania, You Can Fool The World With Your Smiles, But Not With Your Heart. Next PostOffbeat Goa: 12 Mind-Blowing Experiences.